Qatar is a small and wealthy Arab country comprised of arid desert and a long Persian Gulf shoreline of inviting beaches and dunes. Qatar’s uniqueness and attraction is the juxtaposition of its traditions and ancient Islamic designs aside its futuristic skyscrapers and booming ultramodern architecture. Doha – the capital, and home to a spectacular Waterfront Promenade circling Doha Bay, a Corniche with great vistas and a vehicle-free recreational space. Explore the alleys of Souq Waqif filled with the authentic flavors of Qatari street life, architecture, culture, and food. The limestone Museum of Islamic Art, Sheikh Faisal’s private museum, and the resorted early 20th century Barzan Towers are also worth a visit. Al Zubarah Fort – on Qatar’s north-west coast, is an immaculately restored 18th century 150-acre archaeological UNESCO World Heritage site. It covers the remains of a walled coastal town that once ranked as one of the Gulf’s most important pearl diving and trading centers. Learn about pearl diving traditions and pearl quality. Inland Sea (Khor Al Adaid) – A UNESCO recognized reserve just 35 miles south of Doha. An impressive natural wonder where the sea encroaches deep into the heart of the desert. Khor Al Adaid is home to migrant waterfowl, ospreys, and Arabian gazelles, as well as diverse native terrestrial flora. Inaccessible by road, this tranquil expanse of water can only be reached by crossing the rolling dunes – a fun trip! Ras Abrouq Rock Formations – a lunar-like landscape of limestone rock formations sculpted by the wind into mushroom shapes. 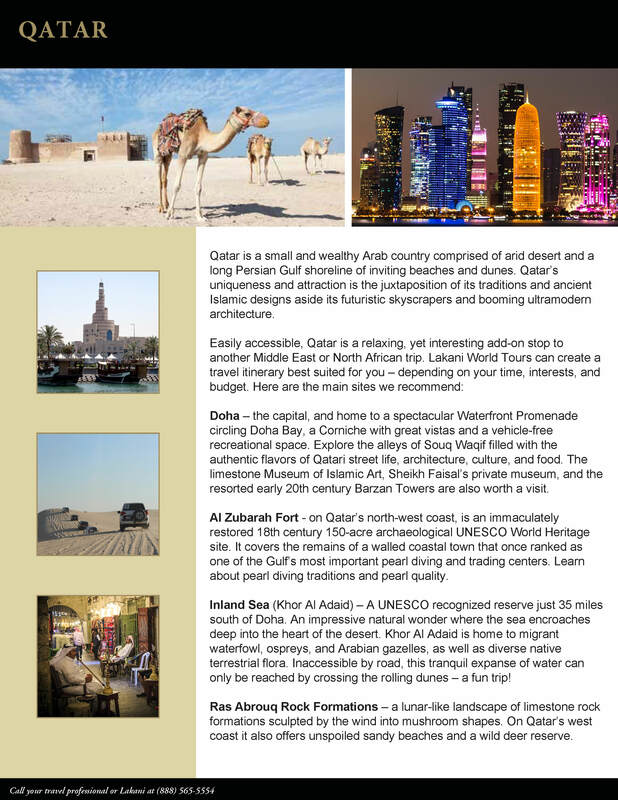 On Qatar’s west coast it also offers unspoiled sandy beaches and a wild deer reserve.